This is a non-public beta of the new µGFX-Studio. If you're interested in participating, please follow the instructions given here. Do not use this version of the µGFX-Studio in a production environment! 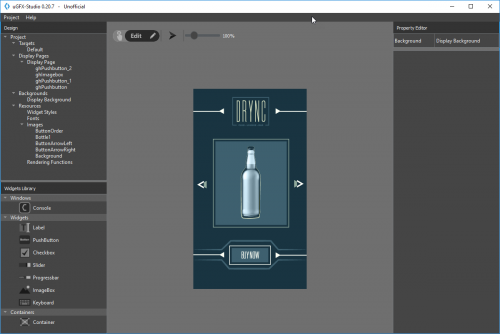 The µGFX-Studio is a tool that allows quickly developing a working GUI using the µGFX library. The studio provides a very simple to use drag'n'drop editor and offers advanced features such as support for custom widget styles and custom fonts. Please note that the µGFX-Studio is currently in beta phase. This software is not meant to be used in a productive environment. We do not guarantee compatibility of µGFX-Studio project across different version of the µGFX-Studio although we give our best to ensure that projects can be used with future releases as well. This is a side-project and the µGFX-Studio does not reflect the performance and the features of the actual µGFX library itself. If you don't find a feature in the µGFX-Studio it doesn't mean that the µGFX library doesn't offer that. We rely on your feedback to improve the quality of the software by fixing bugs and adding new features. Please report any bugs and feature requests to the µGFX forum. We will handle all bug reports and feature requests as quickly as possible.